The NEW Range Rover Evoque retailer tours kicked off with Guy Salmon Land Rover Stratford on Sunday 20th January. The day was a success with visitors flooding in throughout the day, welcomed with a warm beverage from the retro drinks vehicle. "I'm so glad I've got to see the NEW Range Rover Evoque up close at Guy Salmon Stratford, I was welcomed with a warm drink and cake which was a great touch, the NEW Range Rover Evoque is such a beautifully designed car and I can't wait to test drive it..."
The beautifully proportioned Range Rover Evoque then graced the showroom floor at Guy Salmon Land Rover Coventry on Monday 21st January. The preview event at Coventry was a quirky one to say the least. 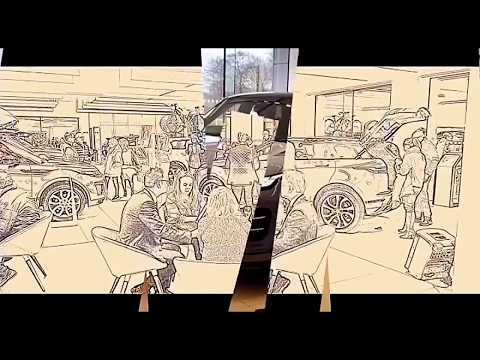 The NEW Range Rover Evoque was surrounded by innovative artwork supplied by The Whitewall Galleries, a range of talented musicians attended as well as The Jaunty Flaneur who were on hand to provide a complimentary luxury shoe shine service to visitors. On top of all this, visitors to the exciting event also indulged in delicious canapes supplied by the Michelin star restaurant, Purnells. Guy Salmon Land Rover Northampton also had the NEW Range Rover Evoque at their retailer on Monday 21st January. "I visited Guy Salmon Land Rover Maidstone and I was so impressed at how much the sales team knew about the NEW Range Rover Evoque. The team were really helpful in answering any questions I had. To top it off the canapes were also delicious." Guy Salmon Thames Ditton were busy on Thursday 30th February with the NEW Range Rover Evoque preview launch. Guy Salmon Land Rover Sheffield marked the half way point for the Guy Salmon Evoque retailer preview tours, the retailer went above and beyond putting on an excellent array of canapes as well as fizz on arrival. On Wednesday 6th February Guy Salmon Bristol warmly welcomed the NEW Range Rover Evoque into their showroom. Love was in the air at Guy Salmon Land Rover Wakefield where guests enjoyed food drinks and fell in love with the all new Range Rover Evoque. Guests had the opportunity to explore the stylish and refined features of NEW Range Rover Evoque – making it centre stage of the Guy Salmon Wakefield showroom. The all new Evoque arrived at Portsmouth where guests enjoyed complimentary prosecco, delicious canapes and the view of the stunning brand new car! Guests got the chance to explore the new Evoque and get an insight into all of its modern features. Look who arrived at Guy Salmon Land Rover Stockport! The all new Evoque was welcomed into the showroom where guests enjoyed all the features of the incredible new model. The NEW Range Rover Evoque made its way to the showroom at Guy Salmon Land Rover Knutsford where guests enjoyed a red carpet experience, live music and all the features of the new model. The NEW Range Rover Evoque ended its pre-release tour at Guy Salmon Land Rover Ascot where guests saw the new Evoque in settings of city life and beyond as well as enjoying some great #helloevoque cupcakes!